Building the foundation for an eight second Y-Block. When Randy Gummelt and I set out to build a Y engine for his rear engine dragster, the plan was to have an engine combination that would run an eight second quarter mile. And Randy also had his sights on the Australian Y record and with a target of an 8.99 or better et, that plan would achieve both goals. By now, it’s pretty well known that Randy ran a best of 8.15 @ 162mph at the Y Shootout during this past Labor Day weekend at Columbus Ohio so the plan was definitely a good one. But to back up a bit, in order to accomplish this it was necessary to figure out a workable combination and then to start gathering up the necessary parts that would make this combination work. Thus the plan starts to take shape as follows. For the basic foundation, it was decided to use a C2AE-C block due to these particular castings being known for their consistent thicker cylinder walls as well as the additional main support webbing that is already present in these blocks. For an aspirated version, I normally have no issues in boring these particular blocks out to 3.860” (+0.110” over) but because this was to be a serious blown effort, the finished bore was targeted at a smaller 3.800” bore to maximize cylinder wall integrity and in turn reduce any chance that cylinder wall flex would potentially kill or hurt some of the power. Part of the reason for going with a 3.800” bore versus a 3.810” bore was being able to get in on a special run of Total Seal brand 1/16” wide gapless rings for a 3.800” bore that were being made for one of the Nascar teams. The 3.810” bore 1/16” wide rings were already available as an off the shelf item but being in a position to make the bore and stroke ‘square’ was more conducive to the overall plan. Because of the supercharged nature of this engine, the top ring would be gapless by design as opposed to normal practice of using a gapless style ring in the 2nd groove in a normally aspirated application. 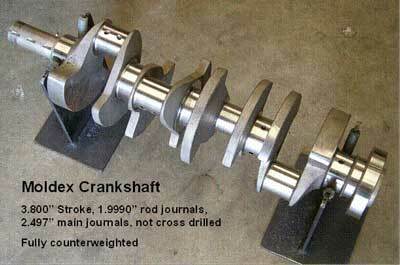 It was determined early on to use a Moldex crank in order to get the desired 3.800” stroke. To facilitate this much stroke and free up some much needed clearance at the camshaft , 2.000” rod journals were specified to bring the rod bolt area of the connecting rod inboard and away from the camshaft. To permit the use of an economically priced SFI approved flywheel, a scrub bolt pattern on the flywheel flange was called for and the face of the flange was spaced ~0.420” further to the rear or away from the engine. This additional spacing was to eliminate any spacers between the flywheel and the torque converter while still maintaining the pre-requisite 0.100” freeplay in the transmissions front pump. The C2 block already incorporated 292 main bearing sizes and so the main journal dimensions were sized as standard 292 size which at least kept main bearing selection both simple and inexpensive. The crankshaft is fully counterweighted which means eight counterweights versus the normal six and even with the additional weight afforded by the extra counterweights, lightening holes were needed in the crankpins to facilitate balancing without an extreme use of heavy metal or tungsten. Both the leading and trailing edges of the counterweights are bullnosed or rounded in shape; no knife edging on this crankshaft. Going to the front end of the crankshaft, the snout was mandated as 1.600” diameter as opposed to the stock 1.250” diameter normally seen on a Y. This allowed the use of the more readily available BBC blower hubs and drive hardware while also reducing significantly any deflection that occurs due to the blower belt pulling heavily on the crankshaft snout. Through the use of a Y marine cover, the crankshaft snout was shortened even more which reduced any potential deflection even further. Although 3/16” woodruff keys (#9 if you’re ordering them) were employed for the timing gear and basic drive hub allignment, an additional groove was machined into the crankshaft at 180° from the other keys so that ¼” keystock could be employed to insure no key failure at the drive hub for the blower. The 2.000” rod journals made it possible to use the considerably less expensive Eagle 6.125” long H-beam connecting rods that were available as an off the shelf item. Even though the connecting rod cross-section was dimensionally smaller by using the 2.000” journal, there was still less than the required minimum of 0.050” clearance to the camshaft. Although only a pair of connecting rods actually had interference issues with the camshaft, all the connecting rods were subsequently modified to insure that they would clear the camshaft in the event of a catastrophic camshaft timing failure. Pistons were a custom order item from Wiseco. These pistons maintain a minimum of 0.260” thickness in their decks for the blower application and incorporate an inverted dome (dish) that adds 27cc’s to the total cylinder volume. Because of the unavailability of a pair of usable 471 heads while gathering up parts, it was decided to use the 113 castings which were attained through and already ported by John Mummert. Because the pistons were going to be custom built regardless of the head being used, the particular head in regards to the chamber size being used was not a major player as the piston dish size could be altered in which to compensate and still maintain the targetted 7.5:1 compression ratio. But had 471 heads been available, then a more desirable ‘D’ shaped dish in the piston would have been used. The particular piston blank that was being used to make the pistons only had a given amount of deck thickness which limited dish design when using the smaller chambered 113 heads. The compression height (pin location) for the pistons is 1.715” which places the top of the piston at a calculated 0.010” in the hole for deck clearance. This basically takes care of the parts required to put a rotating assembly together for the bottom end other than the main support girdle and that’s already been covered in a previous article. Future articles will go deeper into blueprinting and camshaft specifications as well as some of the other modifications that were required to put a final assembly to the engine.